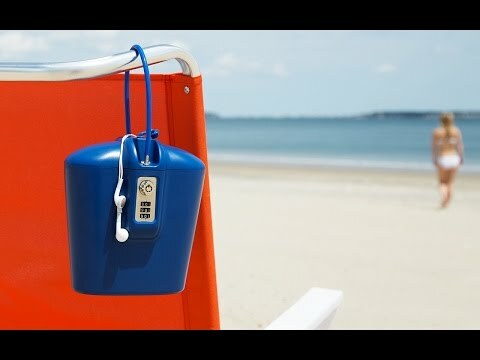 Head to the beach, pool, park, or gym without having to worry about your valuables. 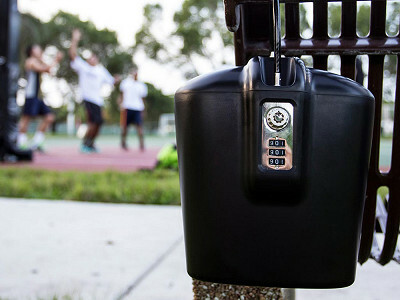 SAFEGO is a portable safe that helps keep small items secure, wherever you are. During a day at the beach, Maker Zack Perlman returned to his towel—only to find that his wallet, cellphone, and keys had been stolen. To help himself and other would-be targets, Zack created a strong, lightweight safe to use on the go. SAFEGO’s strong ABS plastic is water- and sand-resistant. Attach its steel cable to a beach chair, umbrella, picnic table, or anything else that would be difficult to steal. This safe works at home, too—keep one in your closet, or let the kids store their treasures. To set up your safe, set the padlock to 0-0-0 to open. Inside you’ll find instructions and a set of backup keys. There’s room for your phone, wallet, jewelry, passport, or even a small camera. No matter where you are, your valuables belong to you. Keep them that way. Hello hello! I’m Zack Perlman, Co-founder of SAFEGO. We are so excited to have SAFEGO featured as today’s Grommet, and look forward to sharing our new invention with the world. If you have any questions, be sure to drop a comment below and I will be happy to answer them! Can't they cut through the lock with wire cutters?just like bikes? Or how secure is the chain? 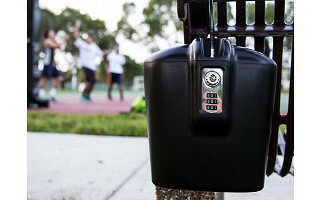 SAFEGO is a theft deterrent that is designed to help protect against common, quick public thievery. Each year in the US over 3 million cell phones are stolen, and most of these occurrences happen in plain site at beaches, pools, parks, malls, and the like. The lock/cord is made from a 6mm thick steel cable. It would take a very thick pair of wire cutters, and a sophisticated thief to steal the safe in plain sight, but it is technically possible. To date, we have not had a single customer come back to us saying that this has happened (and we hope it never does happen!). Great idea! I'll order one as soon as I can think of a way for me or my husband, non-beach goers, to use it. Although SAFEGO is ideal for the beach, it is also great for parks, homes, dorms, cars, offices, and hotel rooms. I keep one in my closet with my passport, some cash, and other valuables that I don't want out in the open. I wonder if you have considered making this in a smaller size with a longer attachment cable. I was thinking it would be a great way to hide a spare key to my house outside. I'm sure I could make this size work, but a smaller size would be easier to hide! Any idea on a time frame as to a larger one may get launched? I am definitely interested in getting a larger size too. I'll let Zack chime in on specifics, but as soon as it is launched, we will let you know, Margaret. Is it big enough for a Kindle or iPad? @Margaret, thanks for your question. Unfortunately neither a Kindle nor iPad will fit into SAFEGO. SAFEGO can fit multiple iPhones and iPhone Plus'. IS the key for the cable and the safe opens with a combination? Do you need the key to open the safe? @valerie each SAFEGO comes with 2 keys. To open the safe, you can either use a key or your combination. One or the other will open the safe. The combination comes preset to 0-0-0, and you can set it to whatever 3 digit combination you would like. Hi Zack, it's unclear to me if you must use the key to unlock or just the code? @Bernadette each SAFEGO comes with 2 keys. To open the safe, you can either use a key or your combination. One or the other will open the safe. The combination comes preset to 0-0-0, and you can set it to whatever 3 digit combination you would like. @Zack: But how do you unlock the cable? When you unlock the entire safe, you can take the cable out of its locked position. Great product. Can't wait for a smaller version. Do the items inside get very hot? Or is there some sort of insulation? @Robin There is no insulation, but the items do not get hot. The ABS plastic outer shell does a good job at not transferring heat onto the products in the safe. We live in Miami, we've done our fair share of testing the product in some of the hottest conditions! I am definitely interested in purchasing a larger size too and was wondering if there is any time frame in mind for making the larger size? Not at the moment, Margaret, but we'll let you know as soon as those sizes are available. I too am very interested in the larger version. Please notify me too! Great idea, by the way. Once I purchase the first SafeGo, I can see I will probably purchase more when the larger version comes available. Good luck! You got it and right you are. At the beach there are thousands of chairs. They could just pick up the chair and all. I would change this picture to something different. Nice concept though. @Glenda and go where with the chair? It seems like that's whole concept of the deterrent. A thief is just gonna steal from a neighboring chair whose items are not locked and secured. @Zack I have a safe like this one, but much smaller. It only holds a key and maybe a phone. This one is much nicer. When we go to the water park or beach, I lock it to a fence rail, or lock 2 chairs together. You can use the same method with SAFEGO, Mike. Now you can just store the whole family's valuables. @Mike I like the locking 2 chairs together idea... simple but smart! It did occur to me that someone could pick up a chair and keep going but if someone had to carry two chairs down the beach to find heavy duty wire cutters to steal your stuff, I'd think they'd just pick up the easy loot instead. Great product! How fast will these ship? I am leaving June 18 on a trip during which this would be very useful. Hi Kathleen, it sure would be. If you get your order in today, you should have no trouble receiving it in time for your trip. this is awesome!!! I have never had anything stolen before but I would buy this product. Going to the beach June 24th so I want it by then. How long does it take to have it delivered? If you put the order in today, Carrie, you should be able to get a few uses in before your beach trip. @Kathleen SAFEGO is made from high-impact ABS plastic. Smashing the shell and opening the safe would be extremely difficult. Zack, this is a clever idea, and, certainly helpful if one is in the immediate vicinity of their valuables. That being said, my suggestion would be to have a ‘cover’ that snaps over the combination. because it’s obvious exposure immediately alerts ‘unsavory characters’ that there are valuables inside! Also, people need to also realize that a lightweight beach chair is not necessarily a deterent, for a clever thief who could simply throw a towel over the bag & chair, carry it off to the trunk of a car, and make a quick getaway! The best use for this would be attached to a ‘pole’ or somewhere that is immovable!!! Still, it’s a smart invention and certainly a better option than leaving all your valuables vulnerable on a beach towel!!. @Rosalind That is a good idea and something we will look into. Thanks for the note! You're from Miami, Have you tried these at Haulover? Is the cable long enough to attach to a lifeguard stand? @Jeffrey No, not yet. But now we must! The cable is 17 inches long. It is able to be wrapped around most poles, stands, chairs, etc. Can you tell us the size of safe and how long the cable is? Hi Donna, SAFEGO is 7" x 4" x 7.5" and the cable is about 18" long. Great idea, Zack! Safego will come in handy hiding/securing jewelry, etc., hanging from my closet clothes rod. Purchasing one...for now...hope to see an upgrade with key and combo lock cover as suggested by another "Grommetier" below. I too wouldn't want to invite curiosity by clearly visible security features in public. @Dana Thanks! We look forward to any additional feedback you have on the product once you are able to use it. @Zack Had to purchase other items from another site and included a Safego I that order. Looking forward to receiving it. Hi John, we will let you know if such a size is launched. In the meantime, perhaps chain a briefcase to the tree? @Mike i don't usually carry briefcases to the beach. and neither do others. I was making a suggestion and not putting down your product. It is a good idea and you can build on that idea.The sarcasm if it was indeed sarcasm was uncalled for. My apologies, John. It was intended to be a playful suggestion, nothing more. I didn't think you were putting it down and we appreciate the suggestion. We like suggestions like this and as you'll see throughout the board, you are one of many with great ideas for future iterations. Truthfully, if such a size is launched we will in fact let you know. I'm assuming this is not fire proof? It would be great to use as a small safe at home - for the items you mentioned (especially if it was a fireproof material). Hi Leto, it isn't fireproof, but still makes for a great safe in the home. Is it waterproof. I was thinking of using it for canoe or boat trips. Also how about leaving out when a pop up storm comes by? Hi John, it is water-resistant not waterproof. It could probably weather a pop up storm because it is also impact resistant. I would just be careful on a boat or canoe to not have it go overboard. I don't think it could handle being submerged without damaging your items. It weighs but a single pound, Karen. So far we have heard trees and fences, Ana. Perhaps rocks or umbrellas could work, too. Hope this helps! I'd love to know when is available that can hold an iPad ( not a mini ). Head to the beach, pool, park, or gym without having to worry about your valuables. SAFEGO is a portable safe that helps keep small items secure, wherever you are. During a day at the beach, Maker Zack Perlman returned to his towel—only to find that his wallet, cellphone, and keys had been stolen. To help himself and other would-be targets, Zack created a strong, lightweight safe to use on the go. SAFEGO’s strong ABS plastic is water- and sand-resistant. Attach its steel cable to a beach chair, umbrella, picnic table, or anything else that would be difficult to steal. This safe works at home, too—keep one in your closet, or let the kids store their treasures. To set up your safe, set the padlock to 0-0-0 to open. Inside you’ll find instructions and a set of backup keys. There’s room for your phone, wallet, jewelry, passport, or even a small camera.